In school they teach you marketing from 30,000 feet, as if you have a brand everyone adores and plenty of cash in the bank to throw at a well rounded ‘media mix’ that magically makes numbers soar. “Marketing is sooooo easy”, you think (already incorrectly equating marketing with advertising). Cue champagne. Hot office parties complete with kegs and drinking. Kinda like The Wolf of Wall Street. Well, the fun parts at least. Then you get a job. Or start a company. And reality hits. Teams are stretched paper thin. Everything’s expected ASAP. Budgets are nonexistent. The good news, is that with some ingenuity and good old-fashioned hustle, you can scale customer acquisition despite – and often because of – your limited internal resources. Here’s how, along with a few tips for each scenario to implement immediately. Significant growth comes down to big wins that deliver outsized returns. That means you generally have 2-3 channels or tactics driving the bulk of your traffic and conversions. Contrary to the financial world, diversification will kill a small organization trying to aggressively grow. You can’t compete on multiple fronts with your puny budget or tiny team. Instead, you need to get scrappy and throw everything you’ve got in one direction – all at the same time – in a single coordinated effort. You do that by doubling down on one approach, avoiding all the time-sucking distractions along the way that prevent you from executing properly. Counterintuitively, your existing internal constraints can help. Tough decisions become blindingly obvious when you’re drastically short in specific resources. Typically that comes in the form of time, labor, or money. Time: You need results – fast! Priority number one is moving the needle, as fast as possible, by doing whatever it takes. Labor: You’re short on bodies, but as a result have a little extra cash and can afford to invest in long-term solutions (because realistically you can’t deliver results tomorrow). Money: You’re cash-strapped, or on a short runway, and can’t afford to splash on flashy trade show booths or ad campaigns. The good news is that you can use this constraint to your advantage, by helping you figure out which route to take and focus on. Maybe you have a board meeting in 6 months and need to show traction. People short on time have one option. And only one option. Advertising. Most small or inexperienced organizations incorrectly assume that advertising is a waste of precious capital. But you’d be surprised if you had proper tracking in place to compare your advertising results (which is a flexible, variable cost) with astronomically expensive overhead costs like payroll (which are rigid, fixed costs). Basic time tracking can help, and Toggl is a great, simple option. The problem, of course, is getting everyone to actually use it. And then having to manually cross-reference results. Time Doctor is a perfect option to avoid this, because it runs automatically in the background while people work. It can help you keep track of where time might be slipping away, which activities are the most distracting or tedious, while also highlighting new ways to optimize performance of remote teams. When you actually compare the data, you’ll see that advertising can present a more affordable option for scaling growth, on a cadence that’s difficult to match. Paid acquisition is the ONLY option that has the power to deliver instant, consistent results. You spend $ 100, bring in $ 120, and continue reinvesting that original amount. The most popular options for this ‘direct-response’ style include AdWords, Facebook or LinkedIn. But don’t hesitate to try new platforms which typically have less competition, meaning your starting budget can be less too. For example, this in-depth (and visual – yay pictures!) guide on Instagram ad best practices is incredibly useful. You can even do media buying on a broader, yet affordable scale through an independent network like BuySellAds.com. But before spending a single dime, you need to figure out an expected budget. I like to walk clients through a simple ad model (below), showcase how you can iterate based on early results while starting a paid campaign for the first time. AdWords remarketing is fairly straightforward, allowing you to run campaigns based on a list of users, people who’ve visited specific parts of your site, or visitors who complete some type of transaction goal. Facebook also provides some really interesting options because of the ability to use custom audiences. For example, you can get a little more sophisticated and target people by ‘buying cycle’ stage. Here’s a guide on optimizing your Facebook sales funnel by using different types of ads for people in each stage. While most of the attention has been focused on advertising so far, it’s critical that your lead gen funnel – the place your traffic is going – has been optimized properly as well. That means your ‘message match’ is perfect. Landing pages are optimized for best practices. You’re testing… something. And marketing automation is tied together so that every single lead receives the right message at the right time. Breaking down a larger transaction into a series of ‘micro-conversions’, and then measuring each, can help you spot the problem areas where breakdowns occur. Most organizations have small marketing teams. Or they’re ill-equipped with great ‘brand’ people, but not many ‘performance’ or ‘growth’-oriented ones. Your ‘team’ might even just be you and a buddy. Regardless, it’s tough to get important things accomplished when you’re having to juggle multiple tasks, wear different hats, or other corny metaphors for multitasking. Realistically that means (a) results won’t come overnight, and (b) your best growth strategy needs to emphasize scale. Advertising (previously mentioned) is a decent potential option, because it scales very effectively without a ton of involvement from people (assuming everything’s up-and-running, and you’re just tweaking here and there). However, the best scaling tactic is organic search (or SEO). Today’s SEO involves all facets of inbound marketing, from content creation to promotion, that means a single investment of time and effort provides compounding results. New blog posts create fodder for social and email. Those social and email campaigns help drive PR. Those PR referrals help drive new editorial links back to the original content, which now achieves greater search visibility – repeating the process to infinite with new links, traffic, leads and customers. Cue the God light and angels softly strumming harps. So where to start with organic search? All of the links in the world won’t help if your site’s riddled with 404 errors and duplicate content. Fire up Screaming Frog or use Moz to help you spot all of these inconsistencies and get them cleaned up ASAP. Search engines have also started factoring in usage data like site traffic and engagement metrics (think bounce rates, time on site, and more). Sites with more traffic and better engagement rates tend to see better rankings too. Login to Google Analytics, find the landing pages with the most visits AND highest bounce rate, and start addressing those first. Everyone knows ‘content is important’. Every two-bit, social media hack journalist has said it over the past few years. But what they neglect to mention is that there are over 2 million posts published each day. Mediocrity, therefore, is a waste of time (and effort). If you only have the resources to do ONE awesome guide or resource, do that, and promote the hell out of it. This should be ‘unbranded content’, primarily focused on audience pain points, and entertaining to some degree. Perhaps no company has done more with less, than PayScale who regularly pumps out interesting resources that get featured by Mashable and other huge media sites. Last but not least, use a tool like Open Site Explorer to ‘spy’ on the competition. The point isn’t to copy the competition. It’s to reverse-engineer. HOW are they getting those links? What’s the broader strategy, or specific campaigns they’re running? And how can you take a similar approach, but leverage your strengths to 10x the quality? For example, the Hard Rock San Diego has run holiday promotions and been featured in these publications in the past. Now how can you extrapolate that for next year’s promotion and outreach? Everyone’s tight on money. But if you’re ESPECIALLY strapped, you should leverage child labor and elbow grease. Specifically, you need to hunt down and develop as many partnerships as possible. And as these will take a bit of time to develop organically, you’ll need to have realistic expectations to know they won’t payoff tomorrow or next week. But the future payoff years from now will be astronomical if done properly. Hope you’re ready to hustle. Cross-promotions are boring, tired, and… effective if done correctly. The trick is to find complementary businesses, who aren’t obviously competitive, but target similar customer segments with similar value propositions. That means a law firm might be the perfect partner for an accountant if you’re looking for high net worth people who invest in real estate. Except, you know, then you have to deal with boring lawyers who just talk about boring cases all day. Start by researching local associations to find a list of members, or upcoming events you might be able to attend (more on that in a second). You can also try LinkedIn, using the prospecting list features to get updates on potential partners to reach out to. The best use of social media is to assist broader PR efforts, not just sit around wasting hours in a Twitter chat. Instead, you can use it to find, research and contact journalists or bloggers who might be interested in what you have to say. The broader goal here isn’t one-to-one communication, but one-to-many (with help from the people who can put you in front of huge audiences). PR agencies are paid for access to their list of journalists and bloggers. But you can manually build your own by outsourcing to Upwork (or similar) at a tiny fraction of the cost (remember that whole Toggl and Time Doctor discussion?). You can also use a tool like Followerwonk, which is like Google Analytics for Twitter, to get a list of socially active bloggers to collaborate on promotions. If the goal is to piggyback on these larger communities to gain access to customers or other potential partners, don’t just attend events. Get involved. Help them set up and take down. Try to speak, host, or sit on a panel. Volunteer for behind-the-scenes meetings or contribute your expertise on particular topics. Whatever it takes to get an in-road, and thus more leverage or influence within that community. One clever approach by Hakka Labs involved them recording audio sessions from various dev-focused meetups and then providing it as a helpful podcast to all the attendees for free. In exchange, group organizers were more than happy to help promote this link and resource to their audience. The best way to grow significantly is through doubling down on big wins. Surprisingly, embracing your constraints can help by focusing the limited resources you do have in a single direction. The good news is that all of these tactics listed here have a single thing in common… they’re all insanely simple. There’s no clever ‘growth hacking’ techniques required. That’s because the most difficult thing to do properly, is execute. Complexity often means things take longer, require more people, and cost more. While keeping it simple (stupid) is the easiest way to prioritize results over theory. 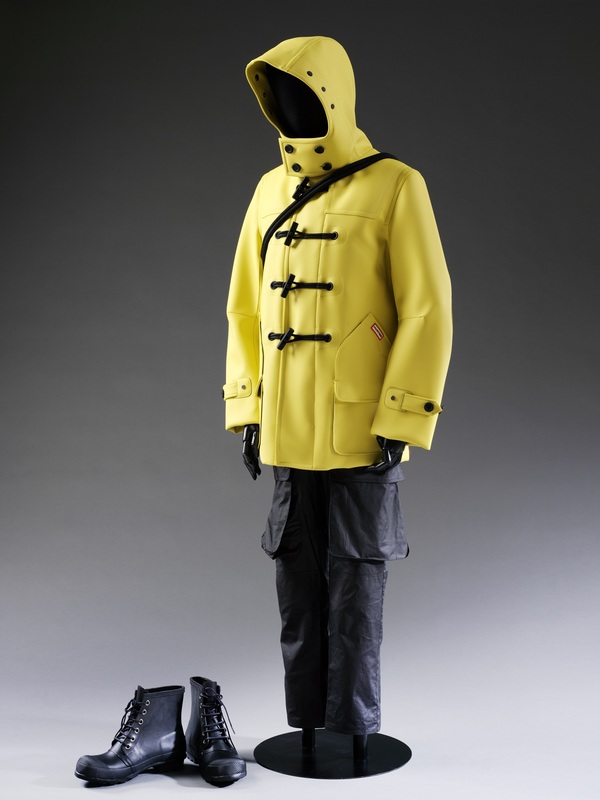 This waterproof ensemble was donated to V&A this earlier year by welly company Hunter, it takes pride of place in our rainwear display in the fashion gallery. It formed part of Hunter’s spectacular first appearance at London Fashion Week in February 2014, a show which presented a bold new direction for a brand often associated with royals, upper-class rural Britain and middle-class urban festival-goers. Hunter originated as a brand of the North British Rubber Company, formed in 1856 by the American entrepreneur Henry Lee Norris. They made boots for soldiers in the First World War, and in 1958 launched their iconic rubber boot, made from 21 separate pieces of vulcanised rubber. In the 1980s, Hunter wellies became a fashion accessory for the urban upper- and middle-classes who idealised the lives or rural gentry. The Official Sloane Ranger Handbook states in reference for their ubiquity in early-1980s west London that ‘London Sloanes sprout green [Hunter] wellies in wet weather like a plague of frogs’. Their first step away from their ‘Sloaney’ reputation came when Kate Moss was photographed at Glastonbury, 2005, wearing a pair of black Hunter wellies. Hunter’s long heritage was something which Alisdhair Willis emphasised after his appointment as creative director in 2013. He wished for the company to focus on finding a ‘harmonious balance between Hunter’s rich heritage as a Scottish waterproof footwear outfitter and a modern brand with the flexibility to push forwards.’ What this means is that Hunter was looking for a wider (probably also younger) audience, while also staying true to what people would traditionally associate with the brand. What Hunter tried to achieve with their Autumn/Winter 2014 collection was a fusion between Hunter’s tradition for excellence and association with ‘Britishness’ with the spirit of adventure. The collection was inspired by expeditions into extreme environments. On a flooded catwalk lined with silver birch trees they showed coats which resembled spacesuits, thick ribbed fisherman’s jumpers and things like this ensemble, inspired by deep sea diving. 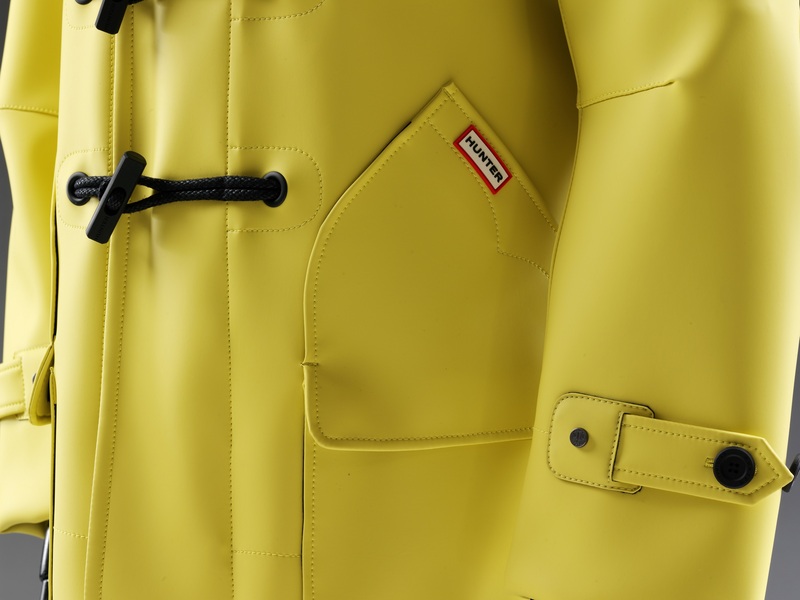 This particular look uses the classically British duffle coat as a starting point; the twist being that it is bright yellow and made from a PVC-polyurethane blend, rather than the traditional blue, grey, green or brown woollen material. Hunter’s own heritage is referenced by the ‘moustaches’ on the pockets – inspired by the moulded details found on the toes of Hunter wellington boots. 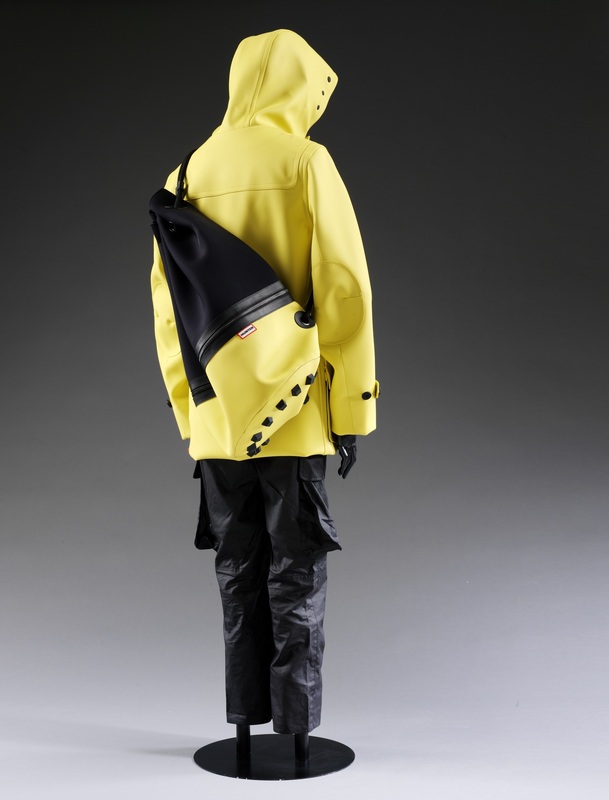 This is an acquisition we are very pleased to have made: it represents the rebirth of a traditional British company as a 21st century high street brand, and also greatly improves the V&A’s holdings of men’s rainwear.